MG came up to State College, Pa. this last weekend to visit my daughter DF with me, and she insisted we go to RBR Recumbents, one of the most well-stocked recumbent shops in the region. Owner Rob told me on a previous visit that he picked State College, home to Penn State University, because of its proximity to 1 million residents within a four-hour drive. Folks come from farther away, however; during our stop a couple who toured by recumbent from Michigan were there to test ride his various models. MG is interested in recumbents (“this week,” she says! ), particularly trikes, and Rob was glad to pull down a Catrike trike and a couple of Bacchettas to ride. He also got out a kids KMX trike for DF to run around the parking lot. See a photoset from our visit at my Flickr page or see the Slideshow. Can I Get This Thing Home Today? Hmmm. MG absolutely loved the Catrike. I thought it was pretty neat, in that it was really maneuverable, like a go-cart. I couldn’t see doing a brevet on one, but it sure was fun in the parking lot. We also tried an ICE trike and two Bachetta highracers, a dual 571mm/650c Strada and a 559mm/26″ touring Giro. The Strada took a few practice runs to keep upright; MG and I both kept tipping over trying to turn. We got the hang of it but the narrow tires made the bike feel tippy. 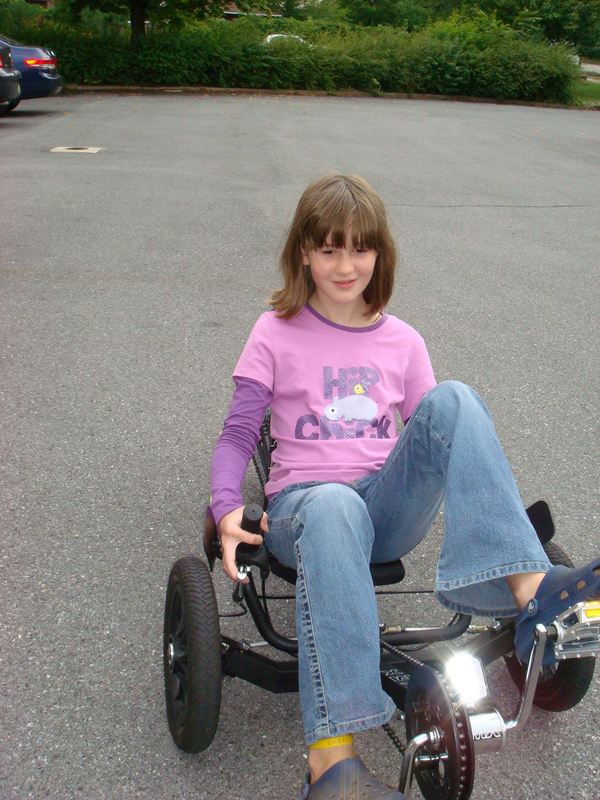 Then we tried the Giro, with wide tires, and it was instantly more comfortable and fun to ride. 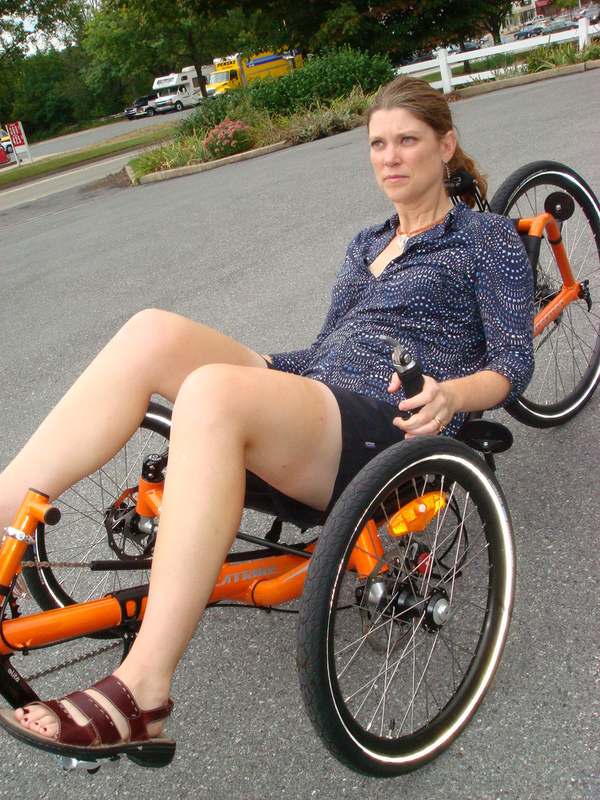 It would be our choice if we were in the market for recumbents. Oh, no, no, no, no, no, no, no. Please no. Not that. Remember I had a rather obscene adjective for recumbent riders. Ok… I officially turn over the my crown as “the dude with too many bikes” to MG. It was a hard fought battle, but, she wins, hands down (besides, all of MG’s bikes are much nicer than mine). You go girl. You can NEVEr have too many bikes! Jeff, you can’t pass the crown yet! I have to save up my pennies first!!!! And sell some of my furniture to make room for all my bikes, ha ha! … JON… why shuch aa obscene adjective for recumbent riders? It must be because of your sore bum or back or maybe just because you look at the road below most of the time. Those thing would get to me also, but you need to get over whatever it is.